With the Patriots and Rams kicking off Sunday evening, it’s the perfect time to look ahead to another football-related event coming to our area this spring with a decidedly local flair. 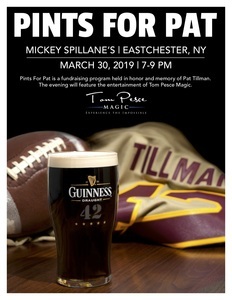 On Saturday, March 30, Pints for Pat comes to Mickey Spillane’s in Eastchester as a means of raising money for the Pat Tillman Foundation. The Foundation, which was created after the death of its namesake in 2004, works to provide scholarship, educational, and networking support for veterans and their families. The choice of both venue and entertainment for the event makes Eastchester’s Pints for Pat different out from other events. While Pints for Pat fundraisers have taken place across the country, they are typically in larger cities such as Seattle, Boston, Chicago, and Washington, D.C. The first Pints for Pat was held in 2009 at Rula Bula, an Irish pub in Tempe, Arizona, frequented by Pat Tillman during his time with the Arizona Cardinals. Honoring that tradition, the Eastchester event organizers selected Mickey Spillane’s as their site for the event. Mickey Spillane’s is not only known for its Irish flavor, but for having a strong connection to the Eastchester community itself. Local magician Tom Pesce, who has been performed at locations across the country in addition to playing venues such as Mohegan Sun, has been announced as the night's featured entertainment. Mr. Pesce, who is based out of Ridgefield, Connecticut, agreed to bring his talents to Pints for Pat. “I was immediately interested in Pints for Pat when I was approached,” Mr. Pesce recounts. “Pat Tillman encompassed qualities that we as Americans should hope to emulate: self-sacrifice, dedication, and love. With over 20 years of experience, Mr. Pesce has played everything from large stages to smaller, intimate events. In many ways, Mr. Pesce’s local ties made him an ideal candidate for event collaboration. As both an educator with multiple graduate degrees and as a father to three young girls, Mr. Pesce appreciates the goals of both the Pat Tillman Foundation and the fundraiser itself.